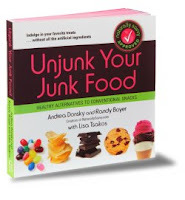 I am so excited to share with you today one of the most helpful, most interesting and most well-written books I have read lately - Unjunk Your Junk Food by by Andrea Donsky, Randy Boyer, and Lisa Tsakos. Unjunk Your Junk Food is a fun, handy, supermarket-friendly guide to the best-tasting, best-for-you junk food made with natural ingredients. Let me be honest for a second...I LIKE junk food. I have tried going without my sweets, treats and salty snacks, but I like to snack and I LOVE my sweets! What I love about this book is that they aren't saying you can't have them, you just have to be careful which brands and kinds you buy! It REALLY makes a difference!! You don’t have to give up the foods you love, just give up the toxic ingredients. Take the junk out of your junk food! The size is nice and small so that you can even take it in your purse or bag to the grocery store to help you remember what food/ingredients are good and which to look out for! (sucralose), Ace-K (Acesulfame Potassium), Saccharine, etc. Sadly, many of the chips, chocolates, and treats we enjoy had these icky ingredients in them - Candy bars (such as Snickers, Reeses, etc), Chips (Doritos, Cheetos, etc), and some of our other favorite treats had them in them. I usually buy all organic products, but sometimes I slack on buying organic snacks and treats and I was so sad to see these 'Scary Seven' in them! I will definitely be thinking twice about buying these brands again - I hate that they don't care about our health enough to make products without harmful ingredients! I can't wait to try some of the other alternatives that the book recommends! I really want to support companies that care about what they are putting in their food! This book is so good that celebrities like Maria Shriver and Alan Arkin have endorsed the book. To view their testimonials, click here: http://bit.ly/zRZAqc. If you want to educate yourself about what icky ingredients companies are hurting your body with, make sure to check out Unjunk Your Junk Food! I promise you your eyes will be opened and you will definitely think twice about buying that bag of Doritos, Snickers bar, or Cheetos bag next time! But best of all, you will be able to identify the companies and products that are SAFE to eat and still delicious!! For more info on this book and the authors, 'like' Naturally Savvy on Facebook and engage with them on Twitter! GREAT information!! I actually bookmarked this for future reference! Great tips!! Hi! I'm a new follower from the Sunday blog stalk. www.love-and-laundry.blogspot.com great review!